We had a great time down in San Diego when we went to deliver a new batch of mass customization 3D printers to our friends at Feetz. Feetz and retail heavy hitter DSW recently announced a strategic partnership in which DSW will use its considerable selling power to bring Feetz’s custom-fit 3D-printed shoes to consumers. Hot off the heels of this announcement, Feetz has been preparing to ramp up production and install their first high-impact visual retail display for one of DSW’s most highly trafficked stores in New York City. We can’t give away many details just yet, but we’re so excited that the incredible display will include Airwolf 3D printers in action! Many understand the often harrowing struggle of trying to buy the perfect pair of shoes: You look at dozens of pairs of shoes until you find a style you like…only to find that they do not fit properly. Soon you find yourself trying on pair after pair until you find one that fits…only to find that you’re not too jazzed about the color, heel height, or style. Now repeat this process until you find the perfect pair of shoes (if you’re lucky). Maddening, isn’t it? This is exactly what happened to Lucy while shopping for shoes one day. Frustrated and tired, Lucy took a coffee break and ordered up a “grande mocha light with two pumps.” And that’s when it dawned on her: Why can’t buying shoes be as easy as ordering the perfect cup of coffee? That’s when Lucy set out to make chic and comfortable footwear that fits perfectly, offers a myriad of style options, and is easy to purchase. Feetz was born. Feetz is the first company to use 3D printers to produce custom-fitted, sustainable — and super stylish! — shoes. To order a pair of perfectly personalized shoes from Feetz, you simply download the brand’s app onto your mobile device and follow the simple directions for creating a 3D model of your feet. Feetz then uses the precise digital models of your feet to 3D print a fully customized pair of shoes that arrive on your doorstep in less than two weeks. To make things even easier, once your pair of Feetz shoes wears out, simply mail them back and Feetz will recycle the old shoes and ship you a new pair. Your new shoes will be perfectly fitted, of course, thanks to the personalized measurements that they keep on file for you. Why use mass customization 3D printers for creating shoes? As much a tech company as it is an apparel house, Feetz went through a lot of trial and error before finding the right mass customization 3D printers for their product. Feetz needed a robust, user-friendly 3D printer that could produce the shoe’s unique woven-style upper and highly durable, but flexible, soles. Fortunately, Airwolf 3D printers fit the bill. Feetz also considers the visual appeal of Airwolf 3D printers as an added value. Just as Feetz holds its shoes to high standards of function and beauty, Lucy also wanted 3D printers that meet those same standards. Kindly describing Airwolf 3D’s newest generation of Axiom machines as the “Apple of 3D printers,” Lucy found that Airwolf 3D’s mass customization 3D printers not only fulfilled Feetz’s rigorous manufacturing needs, but also serve as equipment that is beautiful enough to appear in Feetz retail displays and media photo shoots. 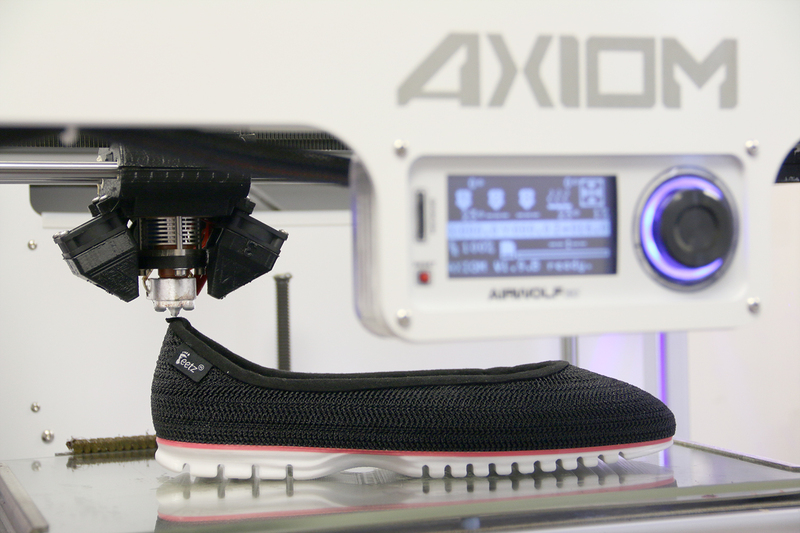 Making flexible shoes with thermoelastic polymers was possible with Airwolf 3D’s direct drive 3d printers. Direct drive extrusion assemblies consistently outperform Bowden configurations with a wide range of materials, including flexible materials such as TPE and TPU. 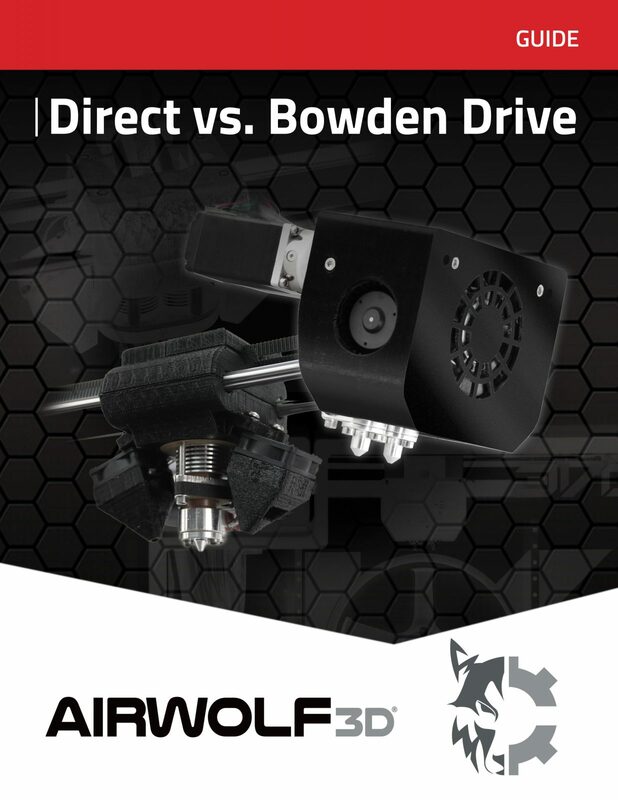 To delve deeper into this topic of Bowden vs direct drive, to learn more about settings and to see images and results from our recent tests, download our white paper below. This entry was posted in 3D Printing for Artists/Designers, 3D Printing for Entrepreneurs, Blog. Bookmark the permalink.